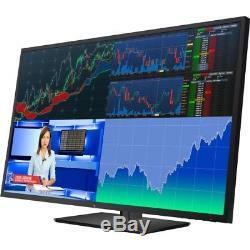 Z43 42.5-inch 4K UHD Display 42.5-in LCD Monitor Business 43in Narrow Bezel Di. Upgrade your impromptu meetings and collaborative brainstorming sessions with the 107.97 cm (42.51) diagonal HP Z43 4K UHD Display. Get started immediately with single USB-CT cable connectivity to your devices. Brilliant views Experience crisp, colorful picture quality and excellent content readability with more than 8 million pixels. The 4K, 3840 x 2160 resolution screen replaces a typical quad-display setup without the bezel interruptions of multi-screen tiling. Go live in seconds Start your meetings fast with one-and-done device connectivity from a single USB-CT cable that declutters your workspace, receives video and data, and can power your device up to 65W. Create a content jam session Redefine onscreen collaboration when you pull content simultaneously from up to four PCs and broadcast together on the screen at the same time with Picture-by-Picture features. Quickly connect to your video source with DisplayPortT, USB-CT, HDMI 2.0 or Mini DisplayPortT; and conferencing tools like a webcam or speakers with 3 USB 3.0 ports and an additional USB-CT port. Place it where you need it. Use the display with its adjustable tilt and swivel stand in conference rooms and workspaces where you need large-scale views of data and content, or take it off the stand and mount on a wall in small spaces with the attached VESA. Add your PC of choice. Drive a meeting from your mobile device, notebook or a collaboration-enabled PC like HP Elite Slice for Meeting Rooms, which has one-touch collaboration keys and is optimized for Skype for Business®. To extend your protection, select an optional HP Care service. Weight with Stand (Approximate): 37.37 lb. Operating Power Consumption: 205 W. Height with Stand: 24.37. Width with Stand: 38.27. Depth with Stand: 9.45. Off-Mode Power Consumption: 250 mW. Energy Consumption per Year: 104 kWh. Maximum Resolution: 3840 x 2160. Contrast Ratio: 5,000,000:1. Pixel Pitch: 9.6 mil. Built-in Devices: USB Hub, Speaker. You are purchasing a product designed for use in North America. The power and transmission requirements may be different then in your local country, please make sure to follow all applicable use and safety regulations. Government and shipper regulations prohibit such behavior. We understand that our customers may change their mind after purchasing a product. We may no longer be able to change or cancel your order. Please excuse any image and typographical errors. The item "NEW HP 1AA85A8#ABA Z43 42.5-inch 4K UHD Display 42.5-in LCD Monitor 43in Narrow" is in sale since Friday, August 17, 2018. This item is in the category "Computers/Tablets & Networking\Monitors, Projectors & Accs\Monitors". The seller is "targetpcinc" and is located in Willoughby, Ohio. This item can be shipped worldwide.